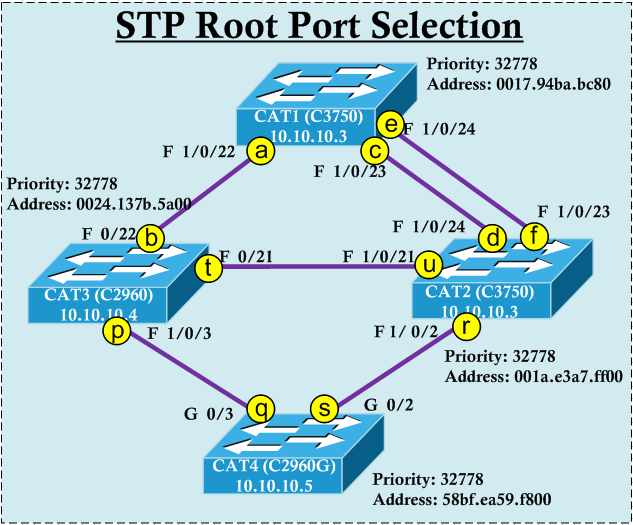 In this post we will see how to manipulate STP root port selection in a given topology. We will use the VLAN 10 (management vlan) STP instance to see which ports will be Root Port in each switch. Any given switch Bridge ID consist of Bridge Priority (default 32768 + system extend ID) & MAC address. Since we are taking vlan10 as example default bridge priority will be 32778. According to the topology CAT1 is having lowest MAC address (hence lowest bridge ID) & will become the Root Bridge. Butif you do not want to rely on MAC addreses you can lower priority of a given switch to make them as the Root Bridge for all VLANs. In my case will make priority for all Vlans to lowest value( which is 0) in CAT1. CAT1(config)#spanning-tree vlan 1-4094 priority ? Now we will look at which port become Root Port in each non-root bridges (CAT2,CAT3,CAT4). 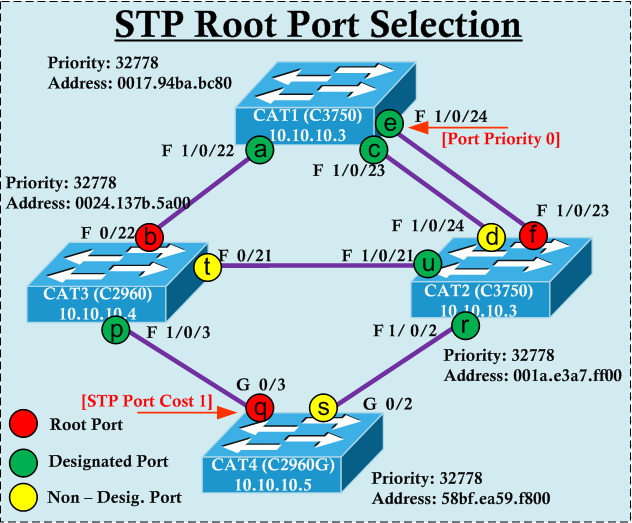 Root Port selection is based on the port having lowest cost to the Root Bridge (CAT1). For PVST (Per VLAN Spanning Tree) path cost will depend on bandwidth of links and cost value is as shown below for most commonly used links. Also it is important to understand how path cost calculate. From Root Bridge it will send BPDU with cost to Root Bridge as “0”. When this BPDU receive by any other switch it will add its own port cost (according to the above mentioned value). So if BPDU receive by a Fast Ethernet port (100 Mbps) it will calculate path cost to root as 19 (0+19). For CAT3, it has 3 different option (label b,t,p). Here Root Port choice is obvious, only via Fa 0/22 (b) is having lowest path cost to Root Bridge. So that will become the Root Port. In our case both port “d” & “f” receiving BPDU from same bridge (CAT1) which suggest “lowest port priority of sender” will be the tie breaker. By default each port is having priority value of 128 (can be 0-256 multiplier of 16). This makes “lowest interface number of sender” it tie breaker. In our case CAT1’s fa1/0/23 is having lower interface number & therefore that BPDU received by CAT2’s fa1/0/24 will become root port. Now let’s see what will happen if you change CAT1’s fa1/0/24 port priority. CAT1(config-if)#spanning-tree vlan 10 port-priority ? Now if you look in CAT2 you would see Fa1/0/23 (connected to CAT1’s fa1/0/24) will become root port because of the lower port priority of sender. For CAT4, both port G0/3 “q” & G0/2 “s” are having equal path cost(38) to root bridge(CAT1). But in this case port “s” is getting BPDU from a lower bridge id switch CAT2 (32778: 001a.e3a7.ff00) comparison to port “q” from CAT3 (32778: 0024.137b.5a00). In this case Port “s” – G0/2 become root port & Port Priority or Interface ID won’t come into play. But in here if you want to make G0/3 as root port you can change it’s port cost to a lower value which results lower path cost to root. In this example I will change it to cost of 1 which resulting path cost to root is 20 via that port. So that will become root port. CAT5(config-if)#spanning-tree vlan 10 cost ? Now you know which port becomes a root port in each non-root switches. So Port “b”, “f” & “q” will become root port in this topology. If you want to identify which ports become Designated Ports (DP) you can follow below rules. 2. Each segment (link) will have ONE Designated Port. If a given link does not have a Root Port, either of them could be a designated port. But lower bridge ID switch port wins in this situation (“u” in “t-u” link & “r” in “r-s” link ) become a DP. In this way ports other than “d”, “t” & “s” will become either DP or RP. Hence those will become “FORWARDING” ports & others (d,t,s) become “BLOCKING” Ports as shown in the below diagram. Here is “show spanning tree vlan 10” output to verify the above. Fa1/0/24            Altn BLK 19        128.26   P2p <- "port d"
Fa0/21              Altn BLK 19        128.21   P2p <- "Port t"
Gi0/2               Altn BLK 19        128.2    P2p <- "port S"
In this way you can manipulate the Root Port selection of your network. Then the diagram and configuration show fa1/0/24 as blocking. hi, Suren, actually I was misled at first, me too. In fact, after you change the priority the F 1/0/24 interface of Cat1 (Root Bridge) so that port F 1/0/23 of Cat2 becomes root port, with the drawing you reported. However this is an excellent example from an educational point of view. Compliments! Hi Luca, Glad you found it useful to understand how STP works. Once you understand basics, it looks easy. That’s correct if you run PVST(per vlan spanning tree) which is default STP type in most of the case. If I run PVST? what if it is Rapid PVST or the standard STP? It is same for RSTP (it is enhanced version of PVST). if you run standard STP setup I think single STP instance for all vlan. I enjoyed and I really love your steps. Now, How about designated port? if one port is set as root port and there are remaining 4 ports on the switch connected to different switches, which port will be designated port? what are the rules/election process for designated port? mmm. interesting.. we should only have one designated port per router what if there are many ports, how to choose the designated port? Typically if it is a router, that will not be running STP (as STP is L2 technology to prevent L2-Loops). If it is a L2 topology (like I have showns), then each link should have one DP. I find the explanations help me in understanding basic of STP. But, i am a bit lost when it comes to the part of choosing the DP. You are correct “U” is the DP in “t-u” link for the same reason you mentioned. I think in my blog same conclusion for that link. where is the blocking port??? HEY!, nice post!! helped me to clear some things out. Is path cost considered while selecting designated port, before using bridge ID as criteria? No, in a given segment (or line) there is no RP, then lowest bridge ID end will becom DP on that segment. this time I do not agree with you. If all costs are equal, which non-root bridge has the lowest BID? If all BIDs are equal, which advertised switchport is the lowest numbered port? Hi Rasika, forgive me what you say is not right. Also to establish the DP the first thing is the root path cost. In the event of a tie, the lowest priority bridge wins. Hi nayarasi, thank you very much for the clear post. It helped me finally to understand it. you say: via port “r” it is having path cost of 57… In my opinion is 39.. right? If you look at CAT4 “show span vlan 10” output, you can see G0/2 and G0/3 STP cost is 19 (I believe link is negotiated to 100Mbps & that is the value use to calculate STP cost, not the physical port speed). So in that case cost would be 57 via port “r”. why above command changed port priority of 1 port and not others ? “CAT2 (fa1/0/24) will become the root port” …. I agree but in your image CAT 2 fa1/0/24 is blocked. It should be root port as it is connected to CAT1 fa1/0/23. As part of my config, I have changed CAT1-G1/0/24 port priority to 0. So from CAT2’s perspective, it will go by lowest port priority of sender, which is connected to CAT2 – g1/0/23. Great article, Keep it up man.